There are many pest control companies servicing Portage County, but most deal with extermination of insects. We deal strictly with wild animals. Wildlife & Environmental Solutions are not merely trappers, but, licensed and insured, professional full-services nuisance wildlife control operators. We offer and provide advanced solutions to any and all of wildlife control needs, from trapping and removal to affected area restoration and sanitization. In Northeast Ohio some of the wildlife species include raccoons, opossums, squirrels, rats, several species of snakes and bats, and more. Many animals can cause considerable damage to a house, not to mention contamination. We offer repairs of animal entry points and the biohazard cleanup needed, plus, we guarantee our work. All of our wildlife trapping is done in a humane manner with proper removal from the residence. 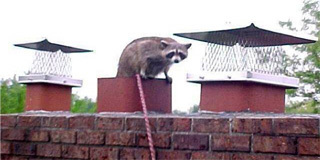 We at Wildlife & Environmental Solutions, have and will offer, the best wildlife solutions in Northeast Ohio. It would be our pleasure to make available a service for your wildlife control needs. Our professional knowledge of wildlife and birds can solve all of your “critter” capture, removal, and/or control needs. Please give us a call or email us for more information.